2Institute of Engineering, Tokyo University of Agriculture and Technology, Tokyo, Japan. Received July 25th, 2011; revised August 28th, 2011; accepted September 29th, 2011.
tended to make more error s th an the other three children. No gen d er differences were observed. spective of the fact that the majority’s choice seemed incorrect. several trials. The minority participant was a naïve participant. with child participants (see Bond & Smith, 1996, for review). witnesses were more susceptible to information given by others. the more susceptible they were. not to conform to members of their peer groups. years old, and none conformed among those aged 15 - 17.
stanzo and Shaw (1966) were somewhat more ambiguous. the detection ability of participants. the original Asch experiment without using confederates. did in Mori and Arai (2010). nicipal school in a middle-sized, somewhat rural city in Japan. the response order in each group. were projected wi th the fMORI Technique (See Figure 1). pant’s sunglasses were placed on the third chair. whether they had detect ed a ny visual illusions during the tasks. “This is a task involving the discriminati on of lengths of li ne s.
you will give your answer in the seat order, from 1 to 4”. attention to the following three points. 2) Please make the judgment all by yourself. stay quiet unless it is your turn to answer. the same nine-stimulus set twice, as those in Asch (1956). participants without intro du c i n g confeder a t e s .
dren, indicating that they had tended to conform to the majority. rates of the majority groups from those of the minority groups. 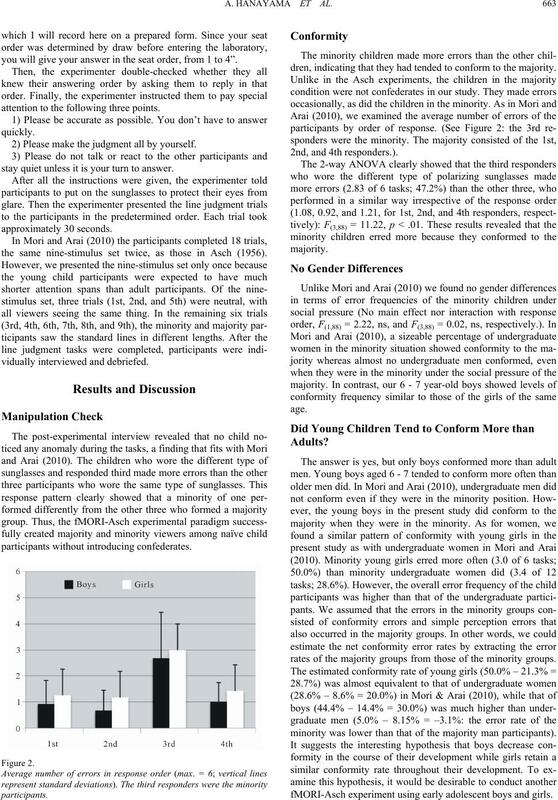 minority was lower than that of the majority man participants). fMORI-Asch experiment using early adoles cent boys and girls. work in editing the English manuscript. graph: General and Applied, 70, 395-407.
distortion of judgments. In E. E. Maccoby, T. M. Newcomb, & E. L.
Hartley (Eds. 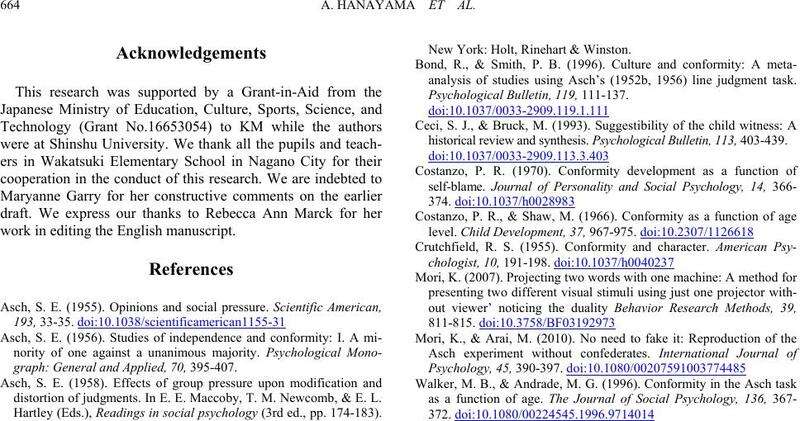 ), Readings in social psychology (3rd ed., pp. 174-183). analysis of studies using Asch’s (1952b, 1956) line judgment task. Psychological Bulletin, 1 1 9, 111-137.
historical review and synthesis. Psychological Bulletin, 113, 403-439.